Radical aestheticism describes a recurring event in some of the most powerful and resonating texts of nineteenth-century British literature, offering us the best way to reckon with what takes place at certain moments in texts by Shelley, Keats, Dickinson, Hopkins, Rossetti, and Wilde. 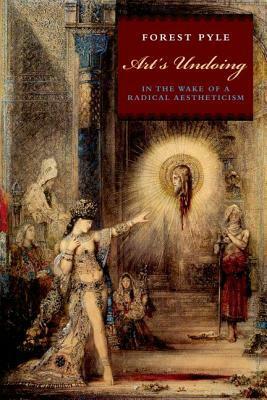 This book explores what happens when these writers, deeply committed to certain versions of ethics, politics, or theology, nonetheless produce an encounter with a radical aestheticism that subjects the authors' projects to a fundamental crisis. A radical aestheticism offers no positive claims for art, whether on ethical or political grounds or on aesthetic grounds, as in "art for art's sake." It provides no transcendent or underlying ground for art's validation. In this sense, a radical aestheticism is the experience of a poesis that exerts so much pressure on the claims and workings of the aesthetic that it becomes a kind of black hole from which no illumination is possible. The radical aestheticism encountered in these writers, in its very extremity, takes us to the constitutive elements-the figures, the images, the semblances-that are at the root of any aestheticism, an encounter registered as evaporation, combustion, or undoing. It is, therefore, an undoing by and of art and aesthetic experience, one that leaves this important literary tradition in its wake. Art's Undoing embraces diverse theoretical projects, from Walter Benjamin to Jacques Derrida. These become something of a parallel text to its literary readings, revealing how some of the most significant theoretical and philosophical projects of our time remain within the wake of a radical aestheticism.